LANSING, MI–After starting the inaugural season 0-3, the Mustangs hit the road seeking their first victory. The Crusaders of Great Lakes Christian College played host to the men from Marygrove on Saturday. The game against the Crusaders in Lansing was exactly one week after the Mustangs played their best game of the young season. Coach Johnson and gang were looking to build off a solid performance at Pikeville College (KY) last Saturday. 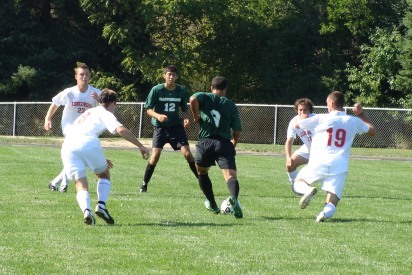 The Mustangs pressured the opposition the entire time, but were unable to put anything into the back of the net. This time, the Mustangs were not only seeking goals, rather they were seeking their first victory in the short history of the program. The Mustangs did exactly that. A strong offensive attack would break down the Crusader defense time and time again. Two Jordan Berry (Dearborn Crestwood) goals would lift the Mustangs to a 2-1 victory; the first win in Mustang Soccer history. Joe de Verteuil (Walled Lake Western) and German Jiminez (Cesar Chavez Academy) would pick up an assist each in the win. Freshman goalkeeper Malcolm Brinker (Plainwell) picked up the win in net after an impressive 90 minutes of play. His efforts, along with a balanced team showing, propelled the Mustangs into the win column for the first time. A Wednesday matchup at Rochester College will be the next test for the youthful Mustangs. The Warriors, a couple years removed from a USCAA National Championship, host the Mustangs at 4pm at Ultimate Soccer in Pontiac.